When tasked by the lovely people at East Village (E20) to think of yet another unique and wonderfully wacky way to launch one of their Sunday markets, we followed our lateral roots and came up with an outlandish idea that would grab more than the odd event listing. That was of course, to take the American Instagram craze ‘Mermaid Toast’ and land it on British shores… at the East Village Market… in Stratford… and give it away, for FREE! In the last year Mermaid Toast has taken the Internet by storm, riding the wave of popularity with Kim Kardashian-West even posting about her love for the food-meets-art. 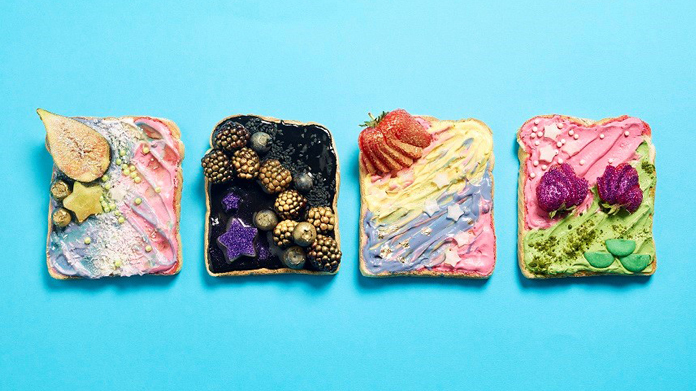 Chances are that you will have seen one (or maybe one hundred) iterations of this beautiful, ocean-inspired toast (or its partially older sister, unicorn toast) on Instagram. We enlisted the help of food artist and baking extraordinaire Miss Trixie to whip up four Mermaid inspired recipes, which we could give away from a Mermaid-themed stall on the opening weekend of the market. These included ‘The Ariel’ – a pastel bright strawberry and mint concoction – and a moody, dark ocean scene complete with blackberries and Nutella Oreo Yoghurt in honour of Ariel’s nemesis, ‘Ursula’. Coverage kicked off with a piece on Evening Standard and in METRO’s ‘Slice’ Newsletter, closely followed by some cracking pieces on Time Out, Yahoo!, MSN, Good Housekeeping, Londonist, London on the Inside, Secret London and a whole heap of trend sites. The story also generated lots of social buzz, with the likes of Square Meal, Delicious Magazine, Soul & Spirit Magazine and Discover London commenting on how to get a ‘slice’ of the action. We will also be welcoming Business Insider and Tastemade down to film the mythical madness this weekend! For fans looking to splash their tails in the waters of this new trend, Miss Trixie will be hosting the stand at East Village’s Market this Sunday (25th June), giving away 500 FREE samples for foodies and trend-junkies to enjoy… Located within leafy Victory Park, the East Village Market will take place every Sunday, launching with over 25 retailers.